I was playing Runequest 6 recently, but its too hard. Not hard as in difficult, although it is a bit, but hard in that its takes a bit of effort and my players just don't want to do that anymore. I blame this in part on the boardgame resurgence we are going through. Boardgames have become really good at being fun and quick to pick up, so my players want a role playing game that does the same thing. So much to my disappointment we have dropped RQ6. As an experiment I ran a D&D5e game with a very simple dungeon crawl, and it went really well. Partly this is because most of my players come from a D&D2-3.5 upbringing, so they picked it up really quick. Its was so much fun that we decided to play a campaign, for which I chose the Freeport environment. I picked Freeport because it was going through Kickstarter at the time, with FATE and Savage Worlds books, but primarily I picked it because it has PIRATES! You may or may not have an idea of how powerful an awesome image or simple concept can be. PIRATES is one of the top ten words you can use to create imagery and atmosphere instantly in the mind of another person. Walk upto someone and say PIRATES and there is a good chance they will go ARRGGGHH! Just like that you are both fictionally simpatico, and that is a powerful thing. I'm not actually even using Pirates much in the Freeport game, most of the adventuring is in, around or under Freeport itself. But by saying PIRATES my players automatically enter into a powerful, mostly unified, imaginary world where they all understand the background of the stereotype I am suggesting to them. You grab their imaginations, then you drag them into your world, and between what they see and what you see you create something new. 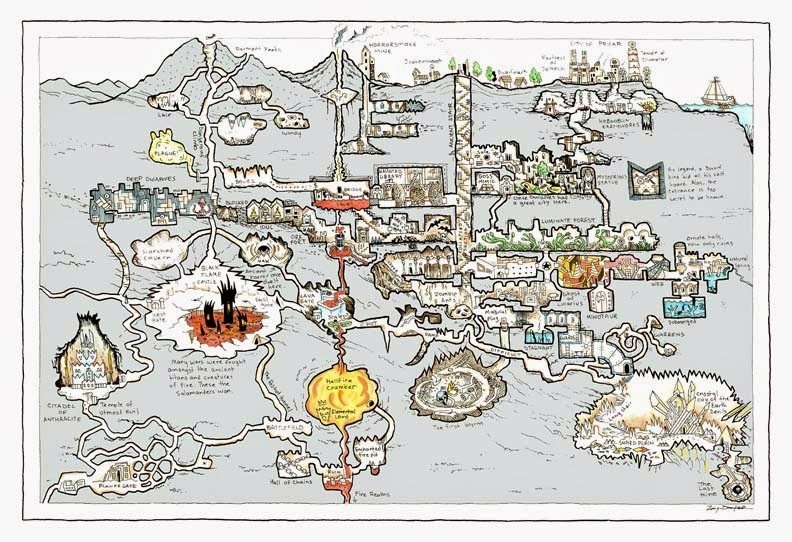 This awesome map has inspired an amazing number of ideas and imaginings and adventures and enthusiasm. And the enthusiasm is the most important part of what it has done. My mind has been buzzing for nearly a week now with thoughts about what I can do with this map. It is so good that I am supporting his Patreon, mostly because he is expanding the map and I want him to do so. The first expansion is already out. For my game I have altered the map a bit. The city in to top right is now Freeport, which strangely fits nicely. Freeport has a volcano sitting behind it also. So then I shifted a few other things around to fit together, like a mission to an old abandoned coalmine has now become the Horrosmoke Mines and will result in the release of a powerful earthquake that will open up that shaft down into the lava. The ruined towers over the long stairwell down are now an adventure that the players can undertake. The Hobgoblin Mines are a bit deeper to allow Freeport to have sewers and to do the Yuan-ti stories, but they resulted in a story arc about foreign slavers, and the Hobgoblin King selling his own people to the Slavers. There is SOOO much potential in this map I am having difficulty writing it all down, I suspect I am forgetting things because they are just popping into my head and overwriting the last one. I love this! Its is this type of thing that gets me going. My Freeport game is now so full of stuff that it would take 3 years to play it all. I'm gonna have to try to cut back some of it. And I haven't even started looking at the bottom half of the map. Imagery is EVERYTHING! We are visual creatures mostly. To aid in that I bought a 55" TV and stuck it down the end of my gaming table, but thats for another post.